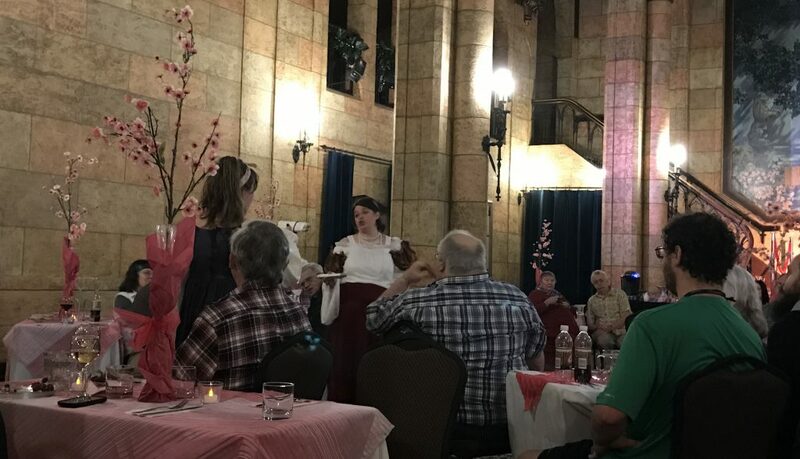 ¶ This past weekend, the Original Practice Shakespeare Company (OPS Fest) started their pre-season run of performances with the Cherry Blossom Theatre Festival in the Oregon state capital, Salem. 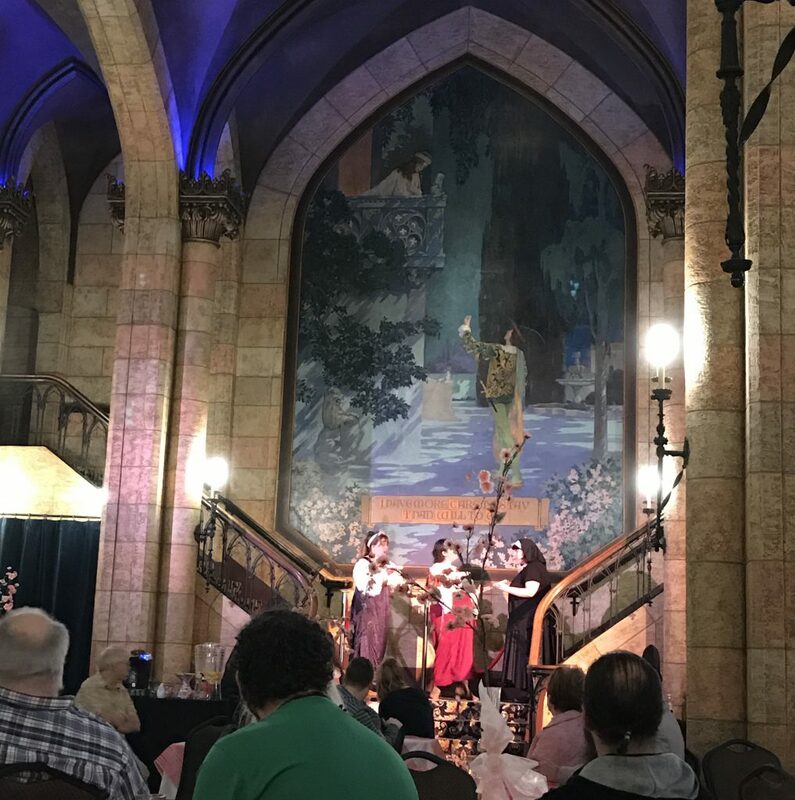 No literary allusion seems to be lost on this town: Gilgamesh Brewing was a major sponsor of the largely comedic offerings up at local venues, including the historic Elsinore Theatre. 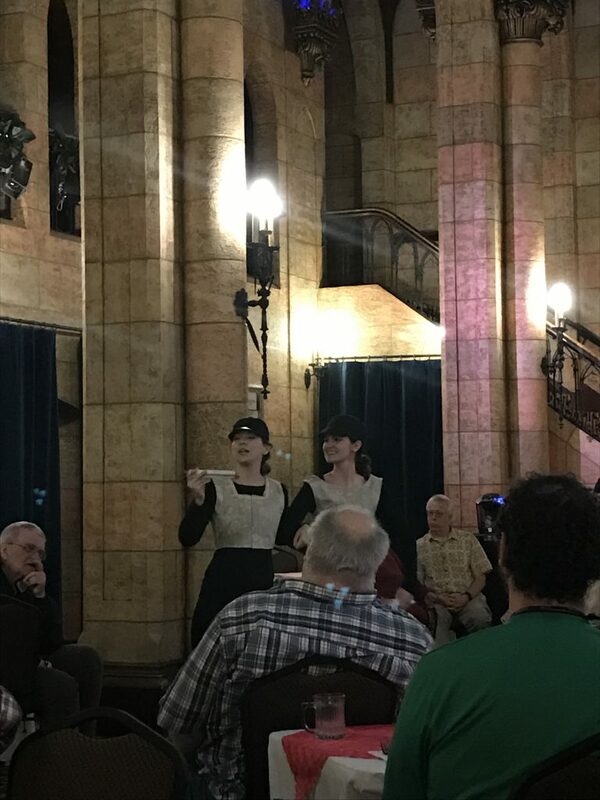 Despite the wonky space, the troupe reflected what worked and works well when borrowing from period techniques when performing in a long hall and surrounded by fruit. From left: Sarah Jane Fridlich (Dromio of Ephesus), Alec Lugo (Solinus), and Keith Cable (Antipholus of Ephesus). ¶ A word about the venue first is necessary. It is a ridiculous space–at least what I saw of it. 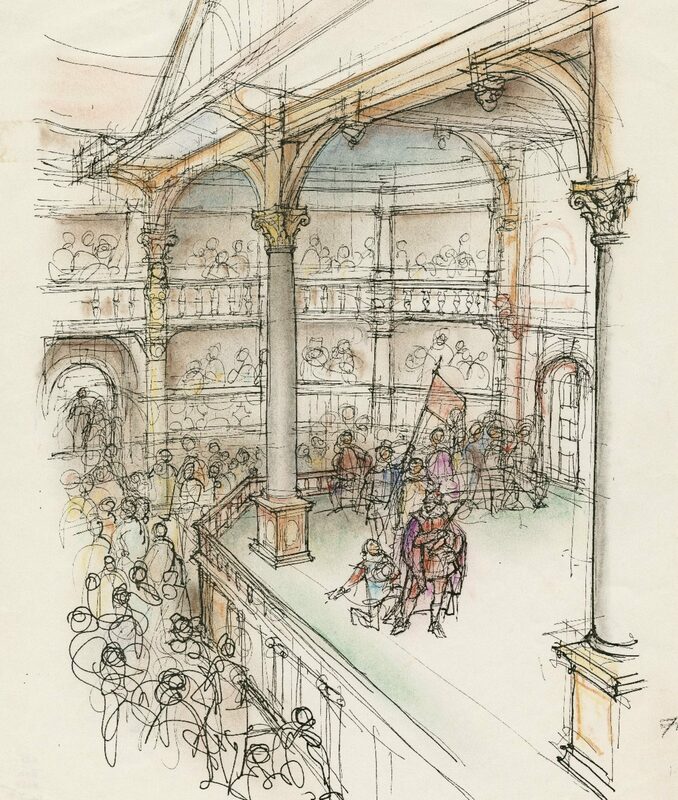 The Sunday afternoon performance took place in the foyer of the venue, comprised of a long hall bookended by capacious staircases leading up to a mezzanine wrapping it way along the circumference of the room. The ceiling have been painted to effect the shape of faux-medieval church vaults, and the walls not covered in frescoes of Shakespearean images and quotations are painted to look like sandstone. Touch one of the wide columns in the room supposedly supporting the faux-vaults and you will hear the uncanny thunk of hollow plastic. We banquet-like tables were arranged throughout the space, covered adorned with plastic cherry blossoms and Pepto-Bismol-pink table cloths. I can appreciate the aspirations of the space, but it felt like being in a weird Baby-Boomer theme-park vision of a Ren Faire writ small. From left: Kaia Maarja Hillier (Luciana), Shandi Muff (Adriana), and Beth Lewis (Aemilia). ¶ That said, there were other aspects of the space and its relationship to the performance that we brilliant–whether the purveyors new it or not. It effected the same shape, intimacy, and movement of a Renaissance English guild hall: the kind of community space sponsored by the Carpenters or Goldsmiths of a town or region for meetings and networking. Touring playing companies depended upon such spaces when the weather was bad to make a living, and so had to adjust to whatever size and accoutrements were available. The one thing most guild halls shared in common with each other as well as with the Elsinore foyer were two main openings used as entrances and exits for both the actors and the food. From left: Kaia Maarja Hillier (Luciana), Shandi Muff (Adriana), Keith Cable (Antipholus of Ephesus), Thomas Anders Witherspoon (Pinch), and Sarah Jane Fridlich (Dromio of Ephesus). ¶ Billed as dinner theatre, there was an open-bar and buffet served at this performance of The Comedy of Errors. 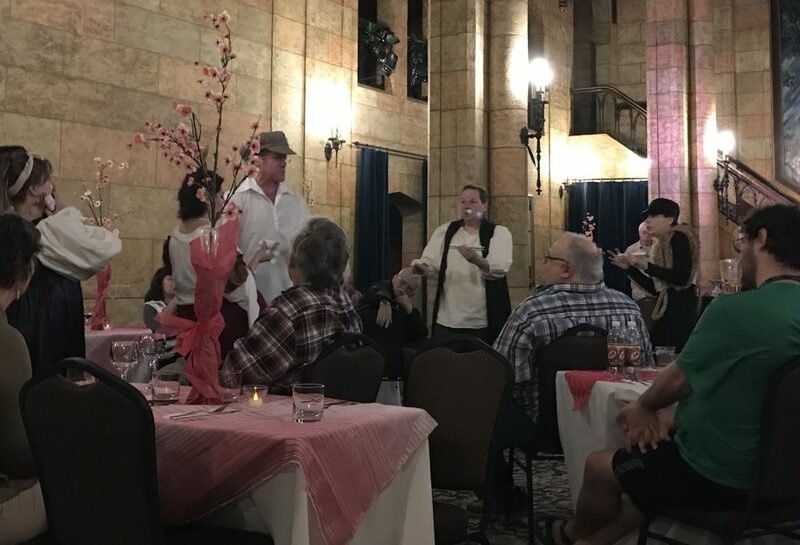 To get at it, you had to exit through the same doorway as the performers—making possible your interaction with (interpolation or interruption of) the performance. The echo of the large hall and the (unnecessary) reverence for the text meant these playgoers stayed in their seats for more often than moved about. For me, the more interruptions, that more the actors have to vie for attention, the more effective the Shakespeare seems to be. For example, in the course of the famous balcony comedy scene (made particularly potent by quick-changes when the Dromios are doubled), much is made of Antipholus bemoaning “I have not dined today.” This has an altogether new resonance when we we are all politely snacking and clinking wine goblets. From left: Kaia Maarja Hillier (Luciana) and Shandi Muff (Adriana). ¶ This is where the First Folio technique seemed to save the day. Without an audience willing to participate or interrupt the play, the Prompter (Joel Patrick Durham) feature provided another means by which to trouble the fourth wall. He was routinely tossed bananas by characters, who had nabbed them from the banquet table. At one point, a banana was delivered to him on the pregnant belly of Adriana (Shandi Muff). I have seen a few stage (here and here) and film versions of Errors, but never have I seen that particular choice. It completely transforms Adriana from a high-maintenance lady to an exasperated and struggling spouse. The temptation is high in this play to vilify her (even if unintentionally) for her ability to boss others about. Muff, taking her clues from the text rather than invention, finds a way to give stakes to Adriana’s anxiety. The Dromios, from left: Sarah Jane Fridlich (Ephesus) and Lauren Kendall (Syracuse). ¶ Unique to OPS Fest is their willingness to play games in the heart of these plays with their prompter. Thus far I have noted it only happens once or twice a show, and it is hysterical. On this night, the Prompter paused to play after Antipholus spoke the lines included as the epigraph to this post. The Prompter then asked about the others kinds of tapestries, aside from Turkish, that Antipholus owned. Having been under a huge painting of a scene from Macbeth (ironically with the lines ripped from an earlier play by Thomas Middleton, The Witches) all afternoon, Cable used the scenery as inspiration for his tale about the McDougal crest tapestry Antipholus owns, how it came to him by way of a Turkish merchant, and so on until stopped by the Prompter. 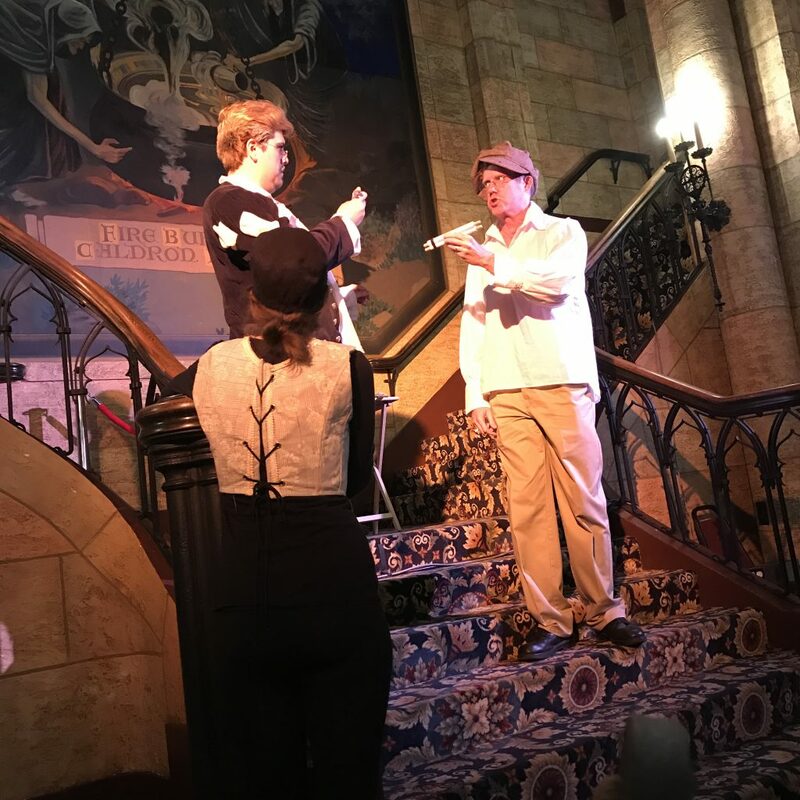 It was a lovely moment both funny, creative, and appealed to audience members with a breadth of Shakespeare plays in their memories. (Oregon audiences seem to be particularly canny in this regard, no doubt in part due to the culture of the Oregon Shakespeare Festival.) This kind of playfulness, linking the space to the text and then to its audiences, seems deeply connected to the spirit of those early fifteenth and sixteenth century playing companies looking for a guildhall to play and hide from the rain. Interested in seeing what First Folio technique looks like? Needing a does of Shakespeare in your spring? Check out the First Night performances of Julius Caesar this weekend at Portland Metro Arts. Saturday at 6PM and Sunday at 2PM — for free!